Protection and restoration of Brule River habitat has been a Club priority for many years. In the long run, maintaining quality habitat will depend on a public that values natural resources, especially free flowing rivers with healthy populations of wild trout. With this in mind, the Club has supported education and outreach efforts over the years. The Club Scholarship has been awarded annually to a college natural resource student since 1999 (click on The Club to read about the scholarship history); and beginning in 2000, the Club initiated "Aquarium Projects" at 2 local schools (click on Aquarium Project to read about the projects). These were modeled after Trout Unlimited's Trout in the Classroom program (click on Trout in the Classroom to learn more). These projects have become popular with teachers and students alike, providing a way for educators to use trout life cycles to teach science and math. 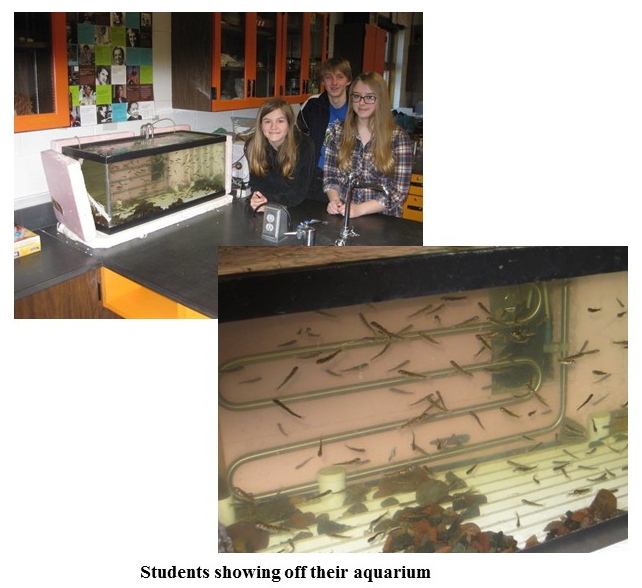 The Club continues to try to increase the effectiveness of these projects by making classroom presentations and through the development of supporting material to better connect student experiences in the classroom to actual habitat in the Brule River. In addition, club members attend a number of different events throughout the year to promote the Club's goals. It was another successful year at the Senior High School in Superior and the Northwestern Middle School in Maple. Survival of lake trout at both schools was excellent. 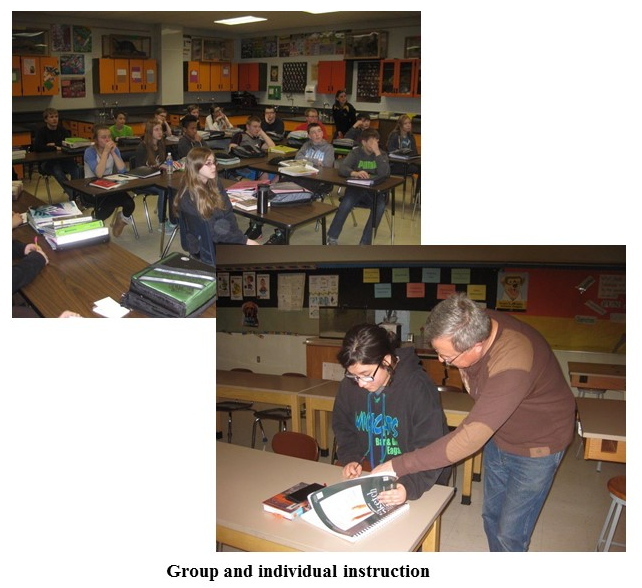 Club members Dennis Pratt and Dennis Smet gave presentations and entertained informative discussions about trout ecology and management in both schools in early March. 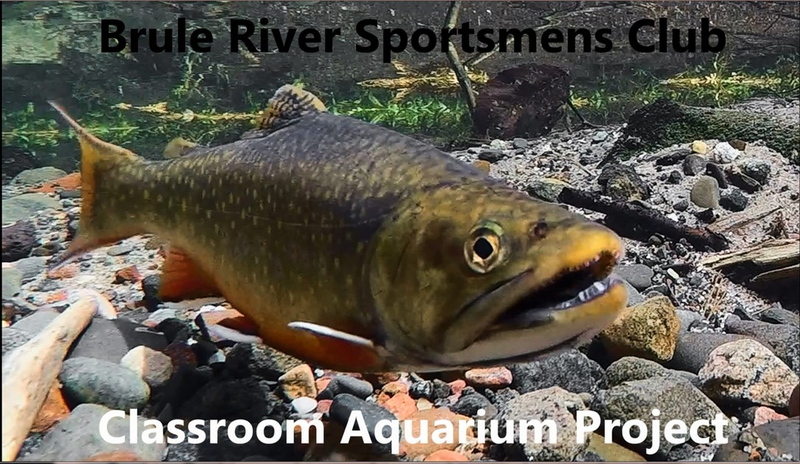 This 6-minute narrated-video relates the hatching and development of trout eggs in the classroom aquarium to the different habitats needed for successful brook trout reproduction in the Brule River. The video is available free to educators by contacting the Club (click on Contact Us). Special thanks to members Ken Lundberg, Dean Wellman, and Courtney Johnson for representing the Club and to Paul Simon and Vic Stark for set-up at the Great Waters Fly Fishing Expo. 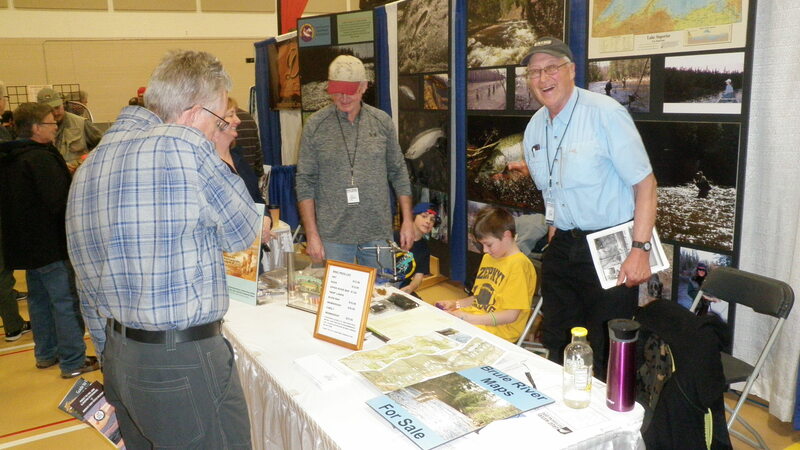 Interest in the Club and our activities was high, and it was talking with fishermen about the Brule. Our Upper and Lower River maps were hot selling items. Pictured are Courtney Johnson and Dean Wellman with two of his grandchildren. The booth was staffed by Courtney Johnson, Ken Lundberg and Dean Wellman. We're always happy to accept tax deductible donations to our scholarship fund! or through our online Club Store by clicking on Club Store.